Girl Least Likely To - ZineWiki - the history and culture of zines, independent media and the small press. Girl Least Likely To is a zine published by April Richardson. 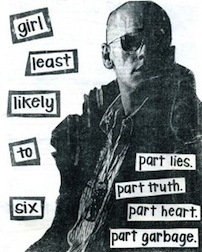 Released in Georgia, U.S.A., Girl Least Likely To was published in the 1990s and named after a Morrisey song. The subjects of the zine included Punk, music, concerts, and personal topics. Included were interviews with bands such as Bis. Girl Least Likely To is included in the Hampshire College Zine Collection, and the Sarah and Jen Wolfe Zine Collection. April has also published the titles Rivers of Suggestion, Victim of Geography, and Geezers Need Excitement : an England Travelogue of Sorts (with Brad "Chip" Pope). AprilRichardson was featured in issue 12 of There's no such thing as a good faerie answering the question, "Why do you do a zine?" This page was last modified on 12 January 2019, at 17:32.